Happy that I got the long run in during vacation. Kind of would have liked to do it here for a speed test but whatever. The marathon isn’t in Denver. Thought I was going to run Wednesday but our flight was earlier than I remembered so I scrapped it. 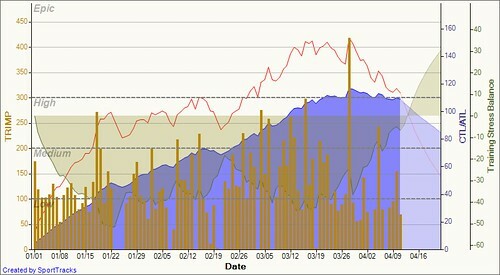 The rest of week I followed my training plan but shifted the days. Took some time to get acclimated. Think its close now. Curious to see how the next few days unfold before I go into full rest mode. Let’s go to the graph. Now is when it really matters. So TSB is rising like a rocket. I am seeing it bounce in the negative single digit numbers. I need to be positive single digits or low teens on race day. So that means holding my intensity on shorter runs right now should do the trick. Managing this daily to keep myself in the zone. Popping up above zero too far before the race means I peaked then. I want to peak on race day. Feeling kind of awkward right now. Hard to listen to my body because it is fighting some sleep deprivation, jet lag, and altitude. I liken it to feeling like you are going through a growth spurt in your teens. Everything feels weird, tight, etc. Hoping it all starts gelling this week. Brownie, Katie, and I met at Left Hand Brewery in Longmont tonight as they passed through town. The place is on BOSTON AVE. How perfect! We chatted about our dominating Colorado prescence at Boston. Be ready. We are coming to run your race, Beantown!